The rollicking dance music called zydeco is a quirky invention that could only have happened in Southwest Louisiana, where descendants of French and Creole-speaking African Americans (who today call themselves Creoles) merged their ancient songs with a rhythm and blues beat. The essential instruments are an amplified accordion, and a frottoir or scrub board, a corrugated sheet-metal vest played with bottle openers that is surely one of the loudest percussion instruments every invented. Electric bass, electric guitar and a drum kit provide the propulsive groove. No one could have predicted that such an idiosyncratic and regional style would flourish into the twenty first century, or that Louisiana’s Creoles would hold so tightly to their music, even as English became their dominant language and as their rural lifestyle slipped mostly into the past. Yet, at trail rides, rodeos, dance halls, church dances and almost any celebration, zydeco is a rallying point of the culture, and if many zydeco musicians have enjoyed the opportunity to tour the world, the music is most vibrant at home. The origins of zydeco are difficult to trace. In 1929, the Creole accordion player Amédé Ardoin and the Cajun fiddle player Dennis McGee made the first recordings of Louisiana Creole music. Their melodies remain a touchstone both for Cajun and zydeco players, as the shared legacy of their intertwining cultures, but the driving rhythm of zydeco is not there. A closer antecedent might be the call-and-response music called juré, with its syncopated hand clapping, but the only glimpse we have of this traditional style is on a few recordings made by the ethnomusicologist Alan Lomax in 1934. The word “zydeco” is a phonetic corruption of the French les haricots, or snap beans. In fact, the phrase les haricots sont pas sales, signifying poverty so dire that there was no salt meat to cook, appears in several of the Lomax recordings. Gradually, the term came to represent both the music and the event, as in “I’m going to the zydeco.” Until the Houston folklorist Mack McCormack promoted the current spelling of the word in the 1960s, it was variously written as zorigo, zarico or zodico on posters advertising weekend dances. In the early 1950s, two musicians fused traditional Creole dance music with rhythm and blues instruments, resulting in the music that we recognize today as zydeco. 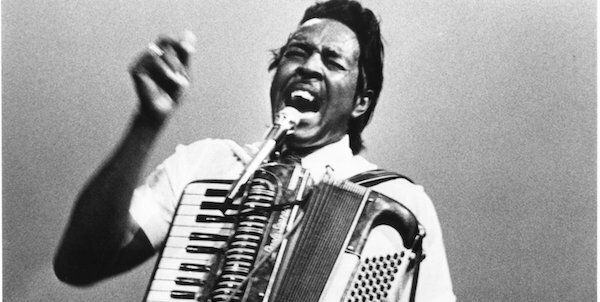 Clifton Chenier, widely recognized as the King of Zydeco, was a virtuoso of the piano accordion, an instrument with a full range of musical possibilities. He brought his own band, the Zodico Ramblers, to the recording sessions in Los Angeles that produced his 1955 Specialty Records hit, “Ay-Tete Fee.” When he teamed up with Arhoolie Records producer Chris Strachwitz in the 1960s, he single-handedly brought zydeco music into popular consciousness, eventually winning a Grammy® award. Chenier would often say “I’m a blues man,” for, in addition to Creole dance tunes, he played R&B hits and down-home blues numbers. In doing so, he laid out the malleable parameters of zydeco that have always made room for the popular music of the day—R&B, soul, hip-hop and pop—filtered through the perspective of an accordion-driven dance band. In contrast, Wilson “Boozoo” Chavis used the smaller diatonic accordion, a “blusier” and louder instrument that can be played in only a few musical keys. He began playing as a teenager, when he entertained patrons at his mother’s race track and dance hall in the Dog Hill area on the outskirts Lake Charles, developing a repertoire of tradition-based songs and nursery-rhyme-like originals. Chavis’s first recording sessions were a forced marriage, when local record producer Eddie Shuler teamed him with the guitarist Classie Ballou’s rhythm and blues band. The resulting “Paper In My Shoe” is an odd record, since Boozoo’s primal accordion and the band appear to be playing in different keys, but it became a regional hit that reputedly sold 100,000 copies after it was leased to the nationally-distributed Imperial label. Nonetheless, Chavis became disenchanted with the music business, and he returned to his trade of training racehorses. It was not until the early 1980s when, encouraged by his family, he returned to the stage at Richard’s Club in Lawtell, Louisiana. His re-emergence was a phenomenon, drawing capacity crowds and setting in motion a scene that would soon explode with new talent. Many audiences even began to prefer the smaller instrument, for the raw edge and pulsating groove it set up for dancing. Today, the contrasting musical schools of Chenier and Chavis remain evident. Musicians who play the piano accordion in Chenier’s style include his son, C.J. Chenier, Nathan Williams, Sr., Buckwheat Zydeco and Corey Ledet. Those who follow in Chavis’s footsteps include Keith Frank, Step Rideau, Chris Ardoin, Sean Ardoin and Jeffrey Broussard. A few modernists such as Geno Delafose, Andre Thierry and Nathan Williams, Jr. have mastered both styles, using whichever instrument best suits a song. Zydeco music is now as much a part of the American musical landscape as bluegrass or Chicago blues, and, perhaps, just as likely to show up in a fast food commercial. It’s a sound that’s here to stay.